Aiseesoft iPad to Computer Transfer Ultimate is a professional and easy-to-use backup tool for iPad users to transfer all iPad files, including music, movies, pictures, TV shows, podcast, iTunes U, ePub, PDF, audio books, camera roll, voice memos, camera shot, to computer or iTunes without any loss. Also it allows users to transfer/backup the iPhone SMS(MMS) and Contacts to computer/the program. Moreover, it highly supports iPad Air, iPad mini 2, iPhone 5s/5c and iPod, etc. 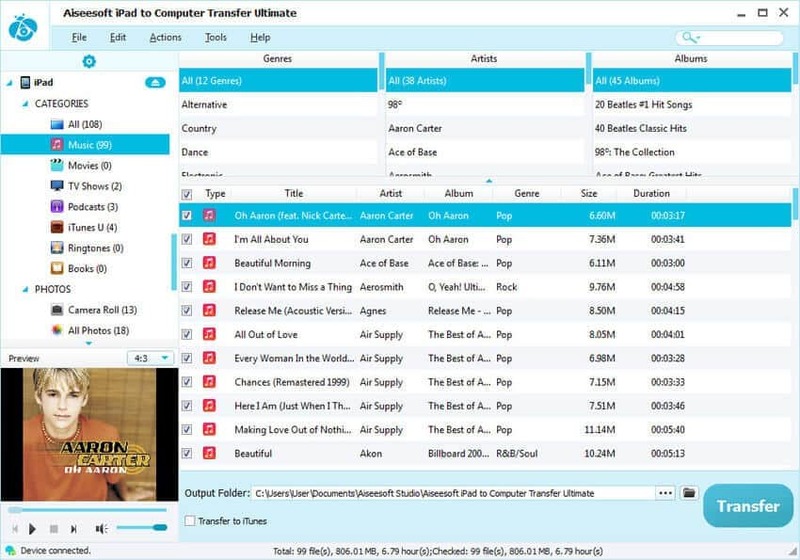 Aiseesoft iPad to Computer Transfer Ultimate can help iPad users transfer all iPad files(music, movie, ringtines, picture, TV show, podcast, iTunes U, ePub, PDF, audio book, camera roll, voice memos, camera shot) to computer or iTunes with nothing lost. With this iPad to Computer Transfer Ultimate, users can transfer the specific SMS/Contacts, all SMS of a specific Contact, or all SMS/Contacts on iPhone to Computer. Also users can backup the iPhone SMS and Contacts to this program, edit or delete the SMS/Contact informations. This software highly supports all versions of iPad, iPod and iPhone including iPad mini 2, iPad Air, iPhone 5s/5c, iPod touch 5, iPod nano 7, iPod shuffle 4 and so on. The built-in player of Aiseesoft iPad to Computer Transfer allows users to preview the iPad video and photo effect. Once you connect your iPad to Computer, this iPad to PC Transfer will auto-scan all your iPad files, and sort these files by Name/Album/Artist/Genre, and then you can find your files more easily.